Although none have been quite as popular as their character in the blue tights and red cape, Jerry Siegel and Joe Shuster created other comic book characters too. One was Slam Bradley, who debuted more than a year earlier. He appeared in the first issue of Detective Comics, more than two years before that title introduced another caped crusader in a bat mask, and remained as a regular feature for 12 years. Slam was a pre-superhero hero, a two-fisted private eye with a fondness for drink and dames, shown here taking on racist caricatures of Japanese thugs (sadly common in those days). 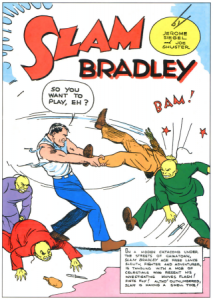 Unlike their more famous creation, which they developed on their own, Siegel and Shuster created Slam Bradley as “work for hire”, meaning that National Publications (as DC was known then) was legally considered the creator, rather than the actual creators. Under PD56 the copyright would have expired after 1993; as a corporate work it won’t enter the Public Domain until 2058. This entry was posted in 1930s, Comics. Bookmark the permalink. I agree wholeheartedly. I think we relaly need to have business courses in our program to teach these topics such as copyright, rights of artists, contracts, pricing and ethical guidelines.It is quite scary how very few students in our program even know what the term “work for hire” is….